Mommy Adventures With Ravina Kurian: Guest Post - How Would You Change the Publishing World? Guest Post - How Would You Change the Publishing World? The publishing world has already changed for the better. With the ebook, authors are now able to truly learn the business of publishing. It may be easy to stick a bunch of wonderful words into the format of an ebook, but it’s difficult to search for the right editor, get the proof reading done, and find your readers—along with discovering good marketing avenues. The ebook is as much a teaching tool as it is a means of communicating and entertaining. It’s helping writers to become entrepreneurs. What self-published writers need now are organized editors who can sell themselves to us based on what genre they edit. After all, an editor who primarily edits romance is not always the best choice for memoir. I’d like to be able to enter a website where numerous editors highlight their strengths and provide endorsements from past clients (authors). Great editors are needed more than ever. I think editors will eventually replace the role of agents. If you find a great editor, you’ll want to keep her for life. As far as standard publishing houses go, and I’ve worked with a publishing house before, the one thing that seemed shockingly absent from the “relationship” was just that—a relationship. I became further and further removed from my work. In effect, I handed over a book and was never consulted on it again. I’m a great force for marketing, but in order for me to help I have to be looked at as a valuable asset. Which means bringing an author into a marketing meeting right at the get go. I’d like to see publishing houses look at all their author relationships, even the new ones, more in terms of partnerships. I’d also like to see author royalties go up (but not necessarily advances). If you’re a fan of supernatural fiction then you will be captivated by this true story about a spiritually sensitive girl and the path that led to her possession. Part one of a two-part series, Saving Mary is the story of a modern-day Mary Magdalene—the woman from whom Jesus cast out seven demons. Deidre Daily is drawn to anything seemingly spiritual, desperately seeking a spiritual existence. But inside this vibrant girl hides a terrified child who sincerely believes she has married the devil. Through a series of spiritual encounters her fear turns into reality, and she ends up possessed. Deidre’s fascinating memoir relays her story from childhood to adolescence: invisible eyes leering at her from the corner of her bedroom, horrible nightmares tormenting her, and her desperate attempt to find God—only to end up possessed. It is a candid account of possession from a first-person perspective. This dark memoir brings to light an intricate world of deceitful spirits hell-bent on manipulating and damaging an innocent girl’s life, not only through her dreams, but also through seemingly every-day encounters. Travel with Deidre into the mysterious world of spirits, ghosts and demons. Awaken yourself to a world that isn’t supposed to exist; a world that’s as intriguing as it is sinister. And then emerge as a new person—invigorated, aware and intent on living in the light. 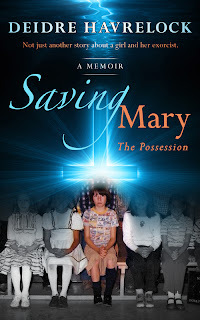 Saving Mary; Not just another story about a girl and her exorcist.